Take the conference home with the Complete Conference MP3 DVD-ROM! 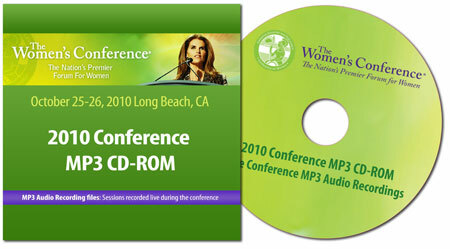 Live Audio Presentations from all recorded sessions from The Women's Conference 2010 in MP3 format. Includes presentations as MP3 files recorded live during the conference. Listen to the sessions on your desktop PC or laptop, iPod or favorite MP3 player.